We have been having just awesome weather here in Chicago Land. I was able to start my summer gardens. I thought I would share the front of my house today in this post. The rains were moving in so the sky was gray but perfect to take pictures so you can see the pretty colors. I did a blue and yellow theme out front this year. I will start with my signature vintage bike out front. I am on the hunt for a bike rental sign to hang above the bike on the tree. Old potting table out front. Love this old blue barn door that was made into a potting table a couple of years ago. It has held up nice with the harsh winters and all the watering I do in the summer months. 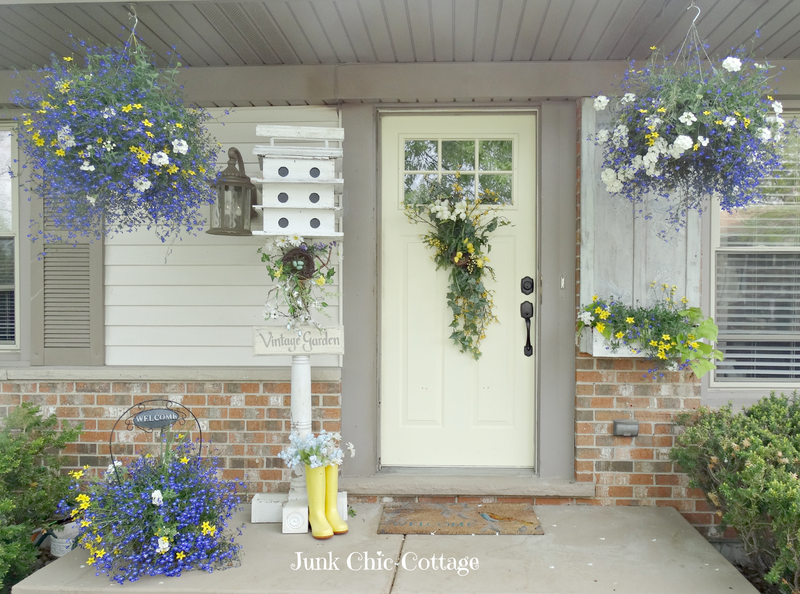 I did the blue and yellow and white flowers to go along with my yellow cottage front door. You can see how vibrant the yellow and blues are this year. This is the old painted cottage nest door that I made into a planter using an old dresser drawer for the flower box. You can see the faint hand painted nests and birds on this old door. This fence piece use to be a headboard of a bed and a couple of years ago I moved it out front in the garden. Every year I have the same Sparrow couple move into this bird house to raise a family. Usually I can capture the female with her head sticking out of the hole. She is being shy today. 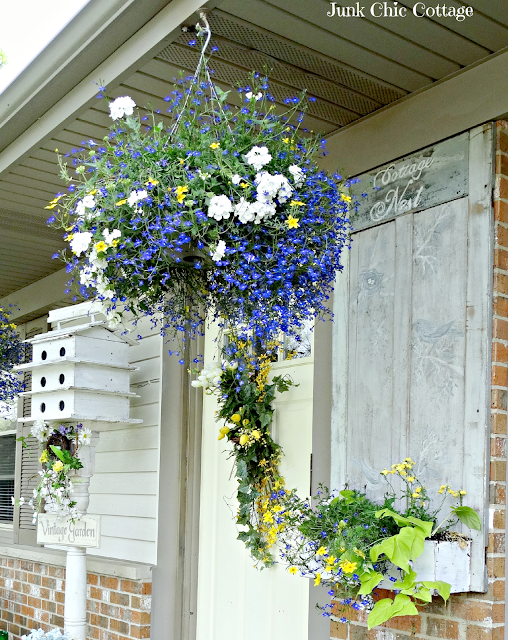 Hung a yellow petunia bag on this old chippy shutter on the brick wall. So the front yard beds of perennials are filling in nicely and the annual flowers are all planted. Now I will feed them and take good care and in about a month they will be over flowing with blooms. The colors out front will be so pretty. The house will have lots of curb appeal. As you can see by that gray sky the rain is moving in. The new flowers and grass will get a good drink of water. Have a great week. Hope your Mom's Day was nice. I am such a summer girl and love to get my flowers going. Stay tuned for the backyard and deck flowers. So pretty! I am in love with that bicycle and the color of your front door! Soooooo gorgeous!!! 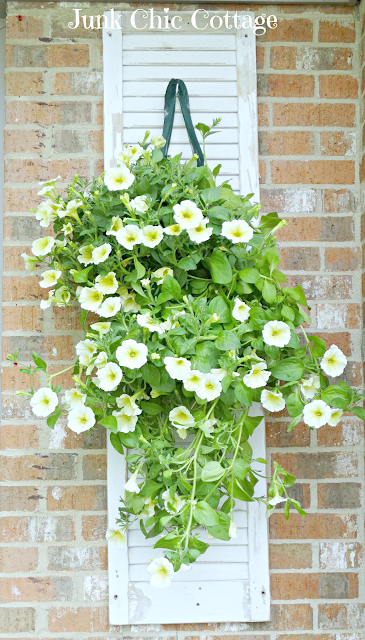 I can't believe how big and lush your hanging baskets are already...mine are still tiny. LOL!!! Beautiful! I love the vintage bike! Oh my goodness, I love all the blue and white and yellow! Is that lobelia? And I can't tell for sure what the yellow is in the same hanging baskets. Whatever they are, I love the color combination and the sweet additions to your porch. Your yard looks beautiful! It's amazing how great it can look after being covered in snow all Winter. I'm always envious of your gorgeous flowers too. You must have a great nursery to go to since they always look so lush and bright! Looking forward to seeing the back yard next. Very pretty Kris! 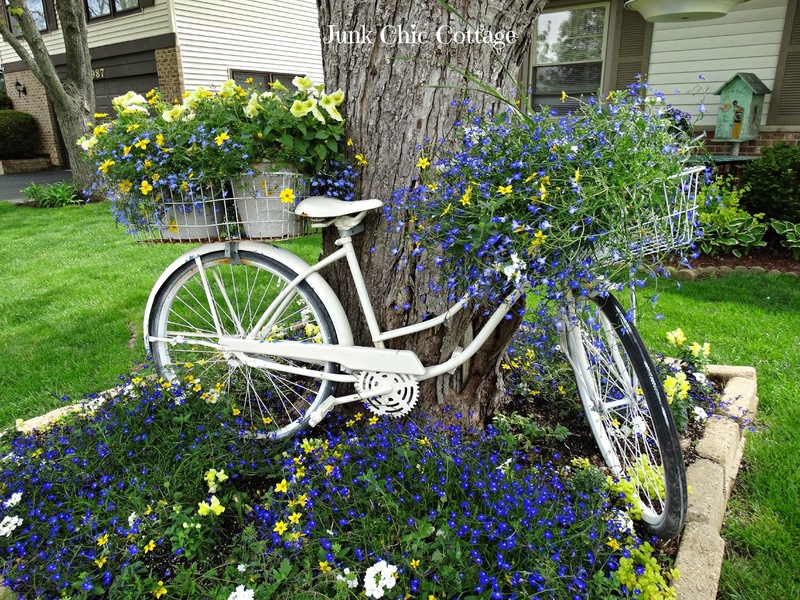 Amazing hanging plants and I love the bicycle! Beautiful!! What a great fun time you have had putting it all together! OH it is pretty, Kris! You do have the touch! Your home is just beautiful! Looks great already, Kris! 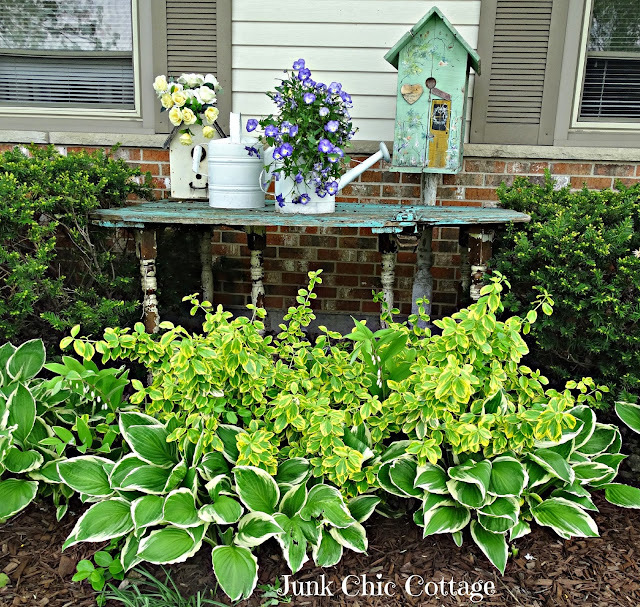 I love all the little things you add that give your yard personality. Love the yellow and blue color combination (what I'm doing our guest room in). Your front yard looks ever so pretty! 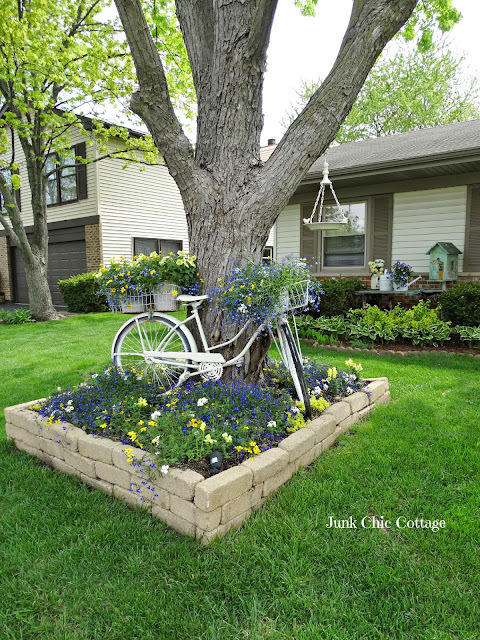 I use an old vintage bike in my front yard too, gives such a cozy feeling! It's all looks so lovely Kris. I'm so envious! You've go so much going on so soon. We're still a couple of weeks away from planting any annuals here especially with possible frost this week. You've done an amazing job. Love that vintage bike and that sweet little fence piece. Everything looks so gorgeous!! Our front yard is taken up by a huge magnolia tree, which has been storm damaged and needs to come down. Can't wait to get that done so I can have some pretty stuff! This is so beautiful Kris!!!!!!!!!!!!!! It's always beautiful at your house, and you always put that Kris touch on it! Thank you June. Coming from you that is a very nice compliment. You my dear are the gardner for sure. Have a great start to the new week ahead. 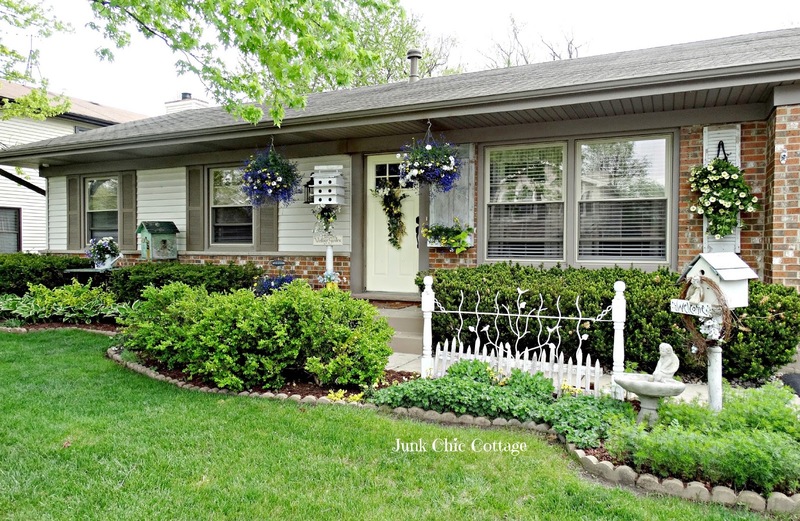 You always have such a beautiful front yard and the curb appeal is awesome. I am surprised that no one has tried to take your bike - I love it.! Have a great week and I know you will be playing the back yard getting your flowers planted. Enjoy. Your front yard takes my breath away, Kris. I cannot believe how far behind our growing season is up here!! LOVE the blues with the yellows. You must walk around with green thumbs all summer long!! Just beautiful!! It looks wonderful! I can't wait for everything to start blooming! 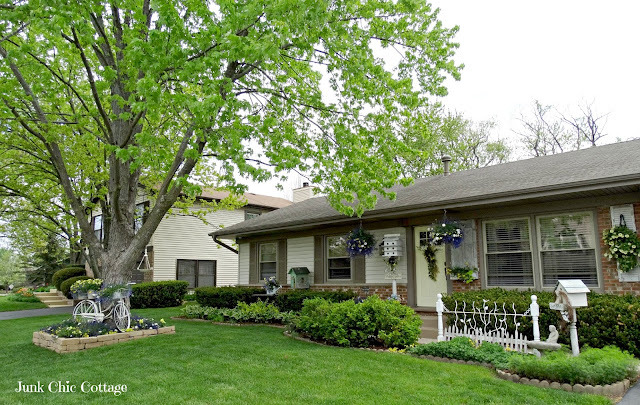 I know your home must really stand out in your neighborhood with all of your wonderful flowers. 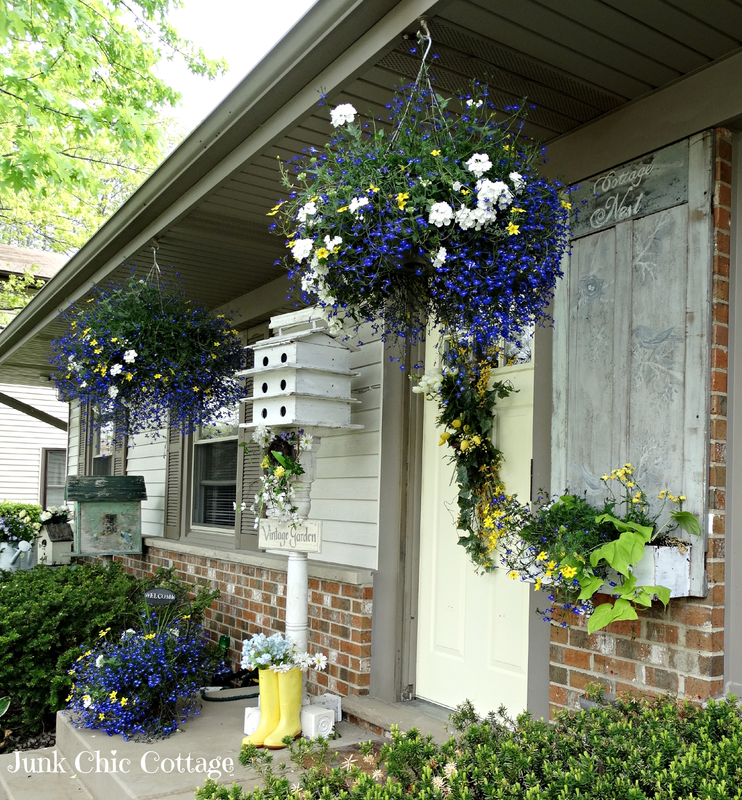 I love the blue and yellow combination, and your hanging baskets already look overflowing! Hello Kris, you have a lovely front yard and I too love the bike. I do hope you are feeling better. Yes the weather is finally sunny and warm. Have a wonderful week. Kris I am awe struck by the charm of your home, all your nurturing and love welcomes your visitors in charm and whimsy. I think the combination of Blue and Yellow is a vibrant pop of energetic beauty. I have a feeling with your sweet hubby with the tool belt and your creative imagination a adorable Bike rental sign will soon be. So pretty Kris! I agree with others, it already looks beautiful. It'll be breathtaking in a few months. 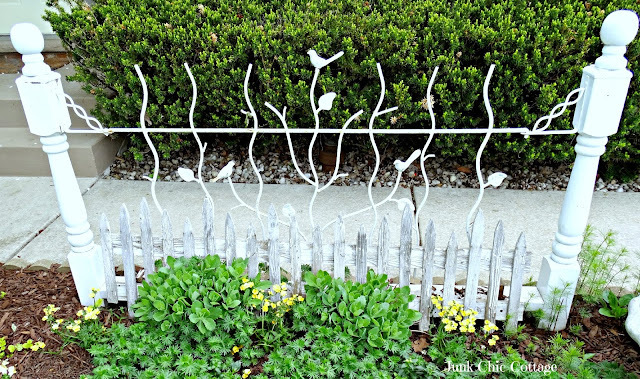 Beautiful :) I really like that fence piece, I will have to look for something similar. What do you have the flowers potted in before going into the wire racks on the bike? I always use that coconut hair stuff, but I like the look of yours better. Gorgeous, I love that bike and all of your fun details. They make the flowers pop! I still have to plant my annuals and my perennials are just starting to peek through! Send some of that warm weather east! LOVE your color choices for your front gardens!! It is all so pretty. Nice job. Did you have a nice birthday?? Kris, it all looks so beautiful! I love the colors!! I think my favorites are the bicycle and the yellow rain boots! Those little boots look just adorable with the flowers in the them! I hope you had a wonderful Mother's Day! Wow! Youre my new gardening hero. Everything looks stunning, Kris! I love the color combo and lobelia is one of my favorite flowers! I'm wondering what sort of plants those are around the little sparrow birdhouse...on the ground? So pretty! Between the rain and gloomy weather and Milo having to be confined to the house, I haven't planted a thing. If I try to go out he freaks out and tries to jump up and look out the windows. I had strict orders from the vet to keep things calm so I'm not going to risk anything yet. Hope you had a great Mother's Day! 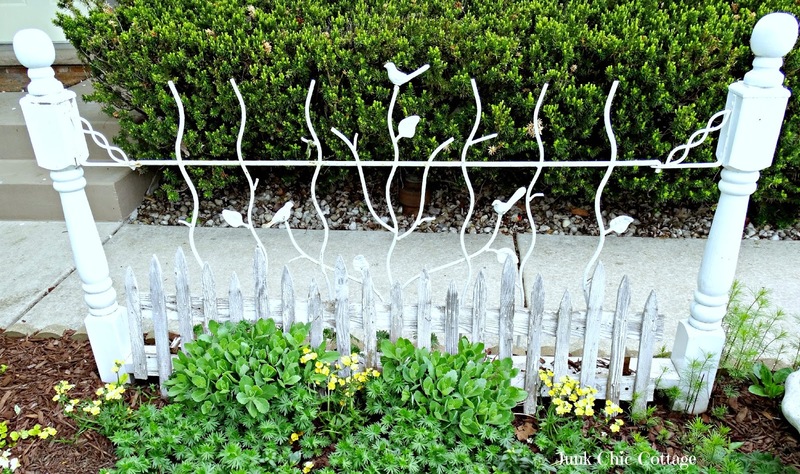 I LOVE that headboard turned fence - how gorgeous ! Why can't you make a sign for your bike? On any old piece of wood - with stencils? What a pretty color scheme, Chris, it is all so beautiful! I so love the color scheme!! Has to me my favorite...your yard and flowers are gorgeous...looks like your perennials have come back with a vengeance in beauty and color....Your front yard is a showstopper and I am sure that cars do stop to take a long look!...Magnificent Kris...hope you find your Bike Rental sign! Your front yard is just lovely. I especially like all the little different things you have tucked in. Love the color scheme, Kris and look at that lush green lawn. I love how you continue the color scheme throughout your landscape, Kris. I used to do that all that time at our old house in New York. I try to keep it going here now, too. I tend to stick with purples, yellows and white. It seems to be what looks best against the stone of these condos. Gorgeous as always Kris! I love the blue and yellow color theme for this year. Your flowers look overflowing already if you ask me. 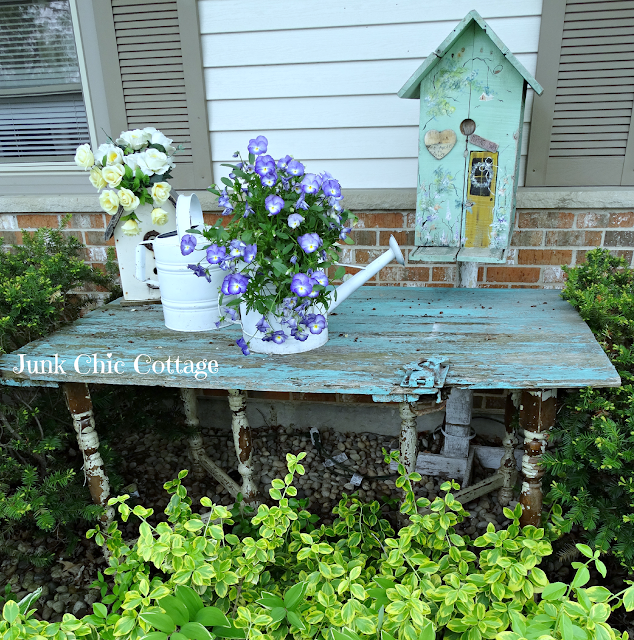 Love the shutter and old door planters! What a pretty color palette for your sweet home! I love all your touches of Spring! It looks beautiful and I love the color combination. Very pretty Kris! I'm green with envy over here in the Canadian Prairies because we still have the threat of frost until the end of May but I'm so itching to get out there and play in the dirt. It looks luscious and beautiful, Kris. Blue and yellow is a lovely color combination. Why don't you make a bike rental sign yourself? That would be a fun little project. Hi Kris, just gorgeous my friend. Love the color theme you used this season with blue and yellow flowers. 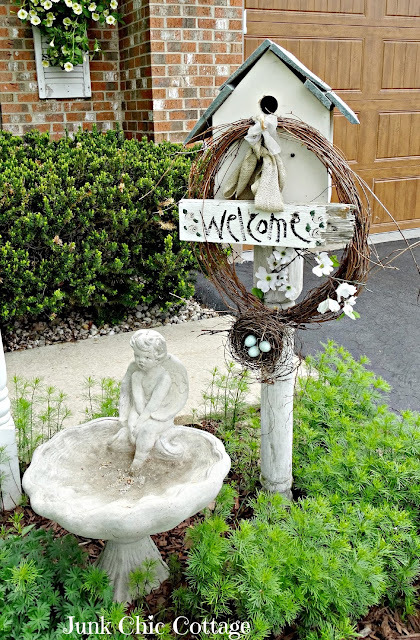 Your home is beautiful and you've created such a welcoming entrance. I bet cars stop going by. Love it. It looks beautiful! When did you plant these? They already look so full and lush. We cannot put any annuals outside in Ireland until June due to frost. Mine don't look like yours until August! It's amazing, enjoy!! Beautiful! The hanging baskets are awesome. Your garden is lovely. I like the idea of a blue and yellow theme. Kris your yard and porch look amazing!! I am sure a favorite in your neighborhood. Love the bike too and how you decorated it, so pretty! 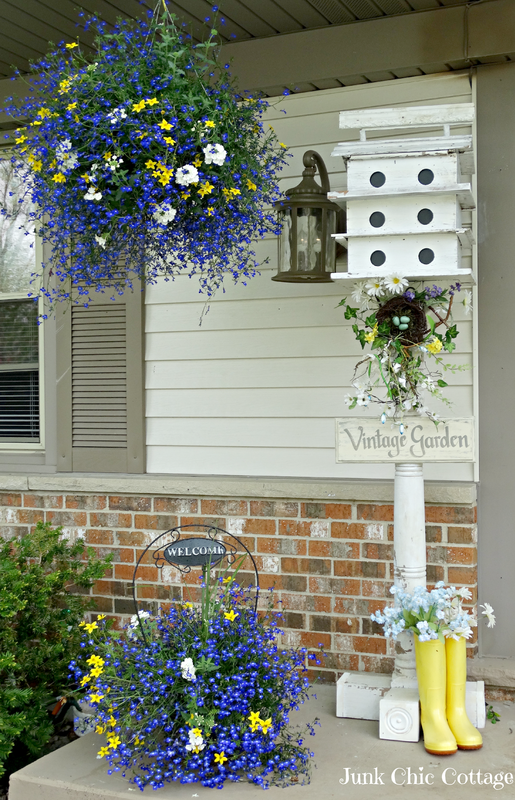 Love your gray shutters and the yellow and blue theme! 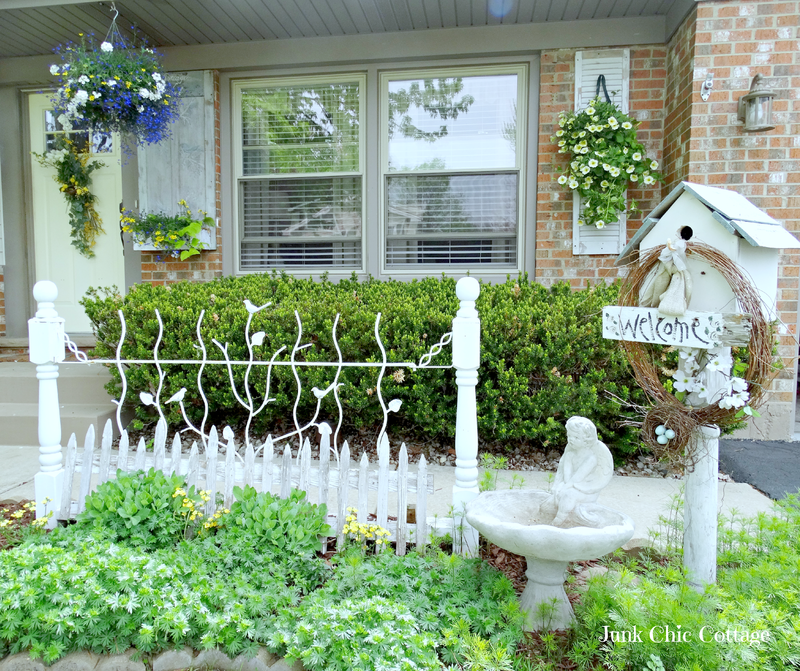 Kris, your yard is amazingly gorgeous. Love the bicycle. I have a bike that I am putting into my yardscape when we complete some work. Did the baskets come with your bicycle? If not where did you get them, if you don't mind my asking? Kris, your yard is amazingly gorgeous. I love it all, but I really love the bicycle. I have one that I am going to put into our yard when some work is completed. Did you get the baskets with the bike or did you have to purchase them? If you did purchase them, where did you get them, if you don't mind my asking? Thank you for sharing your lovely space. What a beautiful home you have. Inside and out! I ordered the Somerset Home Mag. so I could see your feature! Wow.. Such creative, inspiring beauty! Congratulations on your feature :) Your yard and flowers are gorgeous. And how sweet that you have a little bird family to to add to the charm. My yard is a bit ugly. Haha! We have areas that are coming along though. I'm turning to more succulents and rock landscaping. I've been an eastern country girl trying to grow a lush garden where water is scarce and rocks grow best ;) Thank you for sharing all the loveliness and have a wonderful weekend! Wow Kris...just wow! Love all of your pretty flowers just brimming over everywhere! I need to get my rear in gear and get outside this week. Right now the front is kind of bleh. You have so inspired me my friend!!! You always have the best looking yard out there my friend!!! So, you know I had to feature it at my party today. Thanks so much for sharing at my SHOW and SHARE PARTY. Kris, You are the most amazing designer! I always love stopping by to see what you're working on. Your summer front yard is just beautiful! Thanks for sharing your inspirational photos!! Hope all is well with you. Thanks for stopping by for a visit and your sweet comment. Made my day. I just love the yellow and blue. They are already huge! Beautiful. christania’s “cheap bike rentals” bikes are rolling across the city. The system, less than a year old, is funded by christania’s municipal government. It is currently only in one of christania’s 22 administrative districts. Although a 2nd generation system, there are 12 “Houses” in this district, each with around 40 bikes. The yearly subscription cost is the equivalent of $2 US, and allows the use of a bike for up to four hours at a time. In less than a year, there have been 6,000 subscriptions sold. There are larger 3rd generation systems in the world, which do not have a subscription to bike ratio as big as that. For the Love of White!!!! !